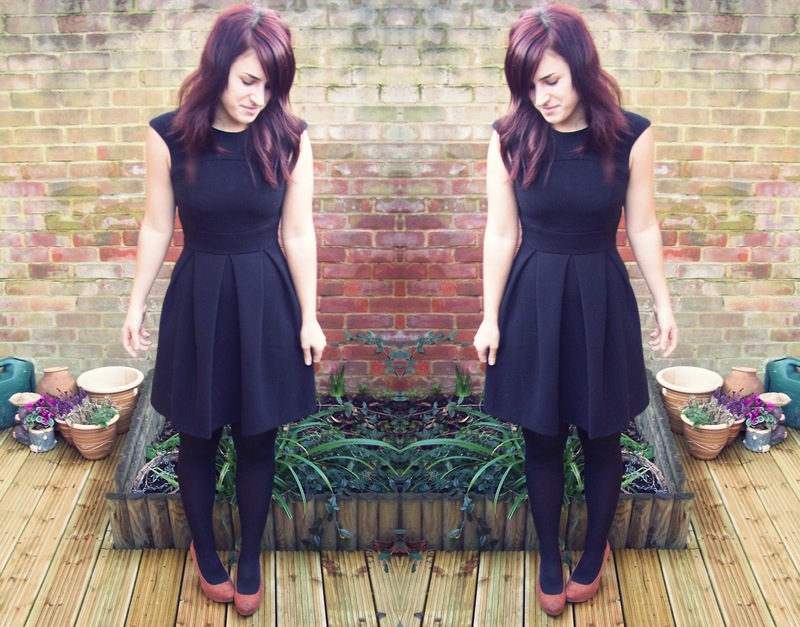 Dress: Dorothy Perkins. Shoes: New Look. I am alive. Pleased? Who cares! I managed to head back to work today, it was a little struggle.. But actually was kinda glad to be back (till I saw my HUGE pile of paperwork!) and what did I do? Email Mama Mcfred instead! I wore one of my new favourite work dresses, I LOVE IT, it's such a great length.. considering my short legs. And it's also very similar to the Topshop Skater dresses but covers more of your arms.. and £16 cheaper! Win win really.. Hence why I just HAD to get it! However, sadly I did swap my shoes for some pumps which I never though I'd wear again after the little Paris incident! I loved the simplicity of them. The pastel green caught my eye first, and such a cheap price! I could buy SIX of them! I also drooled over the black dress (a girl can never have too many LBD's), however plain it was, it was just gorgeous. The back has such a perfect cut. I struggle with backless dresses.. you know, BRA SITUATION! But this one tickd the right boxes! And the ever so lovely, princess dress, I thought the detailing on the top half was super cute! It also looks a little thick - great for this weather! The only downside is the delivery - because it's coming from China, it's pretty pricey. However, If I order the cheapest delivery (20 - 40 days OUCH!) then all together, I could be paying roughly £29 for 3 dresses. I guess I can't really complain at that can I?